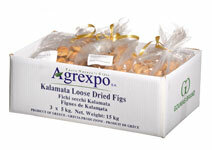 Our company exports dried figs to Canada, USA, Australia, Egypt, Italy, Germany, Austria, Hungary, Czech and Slovakia. Dried figs are available from our company from late August to late October. Messinian dried figs are associated with the area and it’s economical growth. They are naturally dried under the sun and are free of chemicals. They are high on fibers and also calcium, phosphorus, magnesium, iron and vitamin A. Dried figs have healing capabilities also known to Hippocrates. A genuine fruit of Messinian land. In ancient Greece dried figs were regarded, along with olives, as “Pythagorean dinners”. It was known to Byzantine world as “ishades”, meaning the figs that were kept in clay jars through out all winter. This technique was used by all the civilizations of the Mediterranean sea until recently. Romans kept the figs along with the stem soaked in honey. People from the Mediterranean Sea and the Middle East have been making sweets, desserts and beverages for hundreds of years, not only for their unique flavour but also for their great nutritional value.